January 5 – January 1: 29 Weeks 0 Days – 29 Weeks 6 Days. I’m not usually into consumerism. When we bought our house I hit up yard sales, Craigslist, and a friend’s garage to get the furniture we needed—I didn’t buy any large items new. I know that businesses gouge people around big, emotional life events, so when Richard and I got married I made a conscious effort to avoid letting the wedding industry drain our bank accounts. I bought my decorations and (amazing) dress on Craigslist, held the whole event at one venue, chose caterers that didn’t have a special elevated price for weddings, and gratefully accepted help from friends and family for everything from cake-making to officiating. Somehow the baby industry has gotten to me though. I can’t seem to resist wanting the new, the shiny, and the top-of-the-line. I didn’t initially have a theme in mind for the nursery. In fact, I think themes are kind of silly. Our wedding didn’t have a theme—we had a Barbie and Ken cake, truth or dare fortune cookie favors, and Craigslist personals ad-themed place cards. Nothing fit together, and that was the way I wanted it. 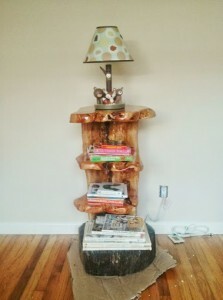 My mom bought us this amazing alternative to the tree bookshelf on Etsy for a fraction of the price. (Sitting on easy-sliding cardboard until we decide on it’s final location because it’s heavy as, well, a stump). When I started working on my baby registry, I quickly found out I couldn’t just add generic “crib sheets” to my list. I had to pick out specific sheets, and the ones with the little forest animals on them were cute, so why not? Add. 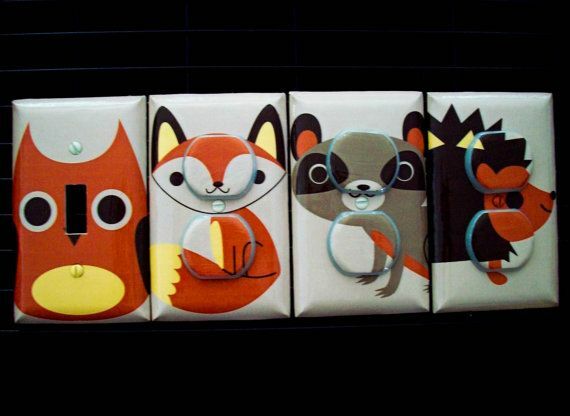 Then there was an adorable mobile with a fox, raccoon, owl, and hedgehog on Etsy. Add (My sister ended up hand-making me something similar, yay!). Then were sweet fox-themed hooded towels, bibs, and burp cloths. Add, add, add. Then I found out those forest friends crib sheets had a whole matching nursery set. Resist. Aagh, can’t. Add lamp, add hamper, and add area rug. Then I found the $80 (each) handmade wooden forest animal bookends on Etsy—expensive, but if someone wanted to get them for me I wouldn’t stop them! Add. 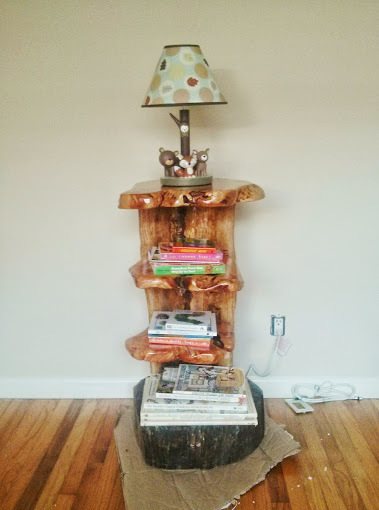 Then the $2100 tree-shaped bookshelf from the same Etsy artist. ADD. Ladies and gentlemen, a nursery theme and a manic, starry-eyed consumer are born. Once a theme had clearly emerged, I deleted several items from my registry that didn’t fit, and added versions that matched my nursery theme, even if they were a little pricier. To give provide some context to show how out-of-character all of this is for me, nothing matches in our house. In our bedroom, we have a mahogany-colored bed frame, a honey-colored bedside table, and a white bedside table. In our office space, we have two cabinets and two desks, each with a different colors of wood. In contrast, when we started looking for cribs, my first filter was for models I could get in a dark wooden color to fit my forest theme. My second filter was that it had to have a matching dresser with a changing top. I’ve officially been seduced by the baby products industry. To cut myself some slack, shopping for nursery furniture is overwhelming and I needed to decrease the search space somehow. 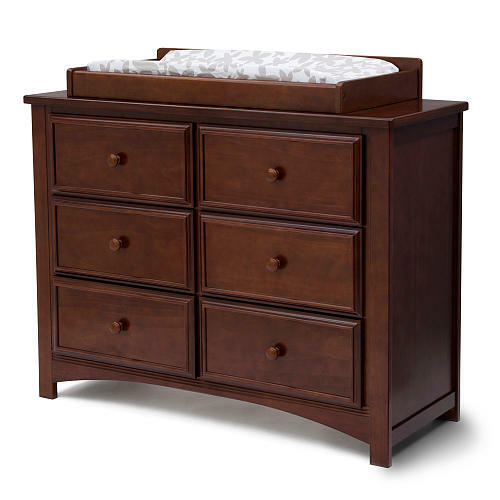 I stand by getting a dresser and changing table in one—that’s a money saver—but I would have saved more money, new-product fumes, and a disturbing amount of Styrofoam packing material had been less picky about matching furniture and found one used. 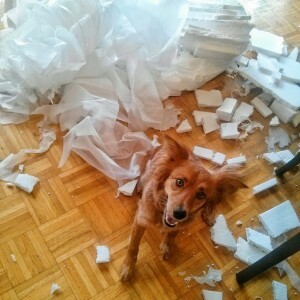 We had the horrifying amount of styrofoam that came with the nursery furniture all bagged up for disposal (5 bags, ughhh), and while we were out Foxy unwrapped it all. Nursery themes aside, cribs are the gateway to getting hooked on new products. 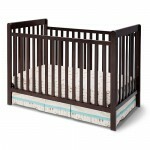 The experts tell you to buy cribs and mattresses new to make sure they’re up to the latest safety standards. Looking for a new crib funneled me into baby stores full of stainless, unscratched, pill-free baby paraphernalia and furniture. Ogle. It also got me worrying about the safety of used items. There are several baby bathtubs selling for $3.50 at my local baby thrift shop, and even though they look like the exact same one I have on my registry, I haven’t bought one because I’ve been irrationally worried about their safety. Reality check: a baby bathtub is just a big bucket that I would never leave my baby unattended in anyway—it would be hard to go wrong. Once I got the superficial filtering out of the way, I did take some time to research and critically compare my favorite cribs (The Consumer Reports crib buying guide was helpful). We chose a crib made of pine, which was affordable, but pine is a softer wood so we can expect a multitude of dents and scratches. I ruled out cribs that contained particle board (common in IKEA furniture) as I’ve read it releases toxic chemicals into the air. However, the crib’s matching dresser has particle board in the back and in the drawers. I thought it would be negligible, but it smells awful! It’s locked away in the nursery-to-be spending some quality time with our purifier. It will be months before the baby sleeps in there, so hopefully it will get most of its off-gassing out of the way by then. 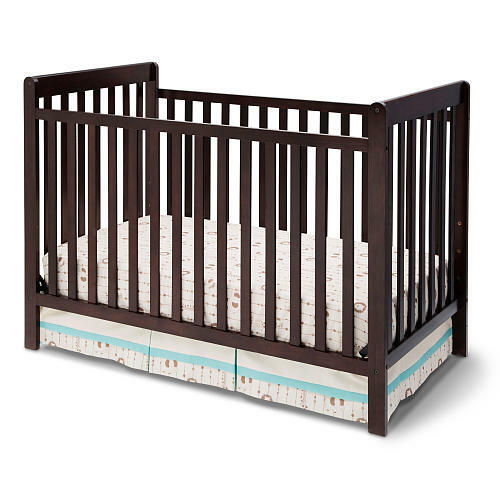 The crib has a painfully basic design—it doesn’t have any extravagant nobs, posts, or details that could easily catch a baby’s clothing and be a strangulation hazard. We decided that a crib that converts into a toddler bed (and a day bed, whatever that is) would be enough (some convert into full beds as well). One salesperson advised us that if we bought a pine crib, by the time the child was at full bed age, the wood would be so beat up we wouldn’t want to use it as a full bed (maybe she was just trying to upsell us though). Selecting a crib mattress was initially confusing (why are there so many?? ), but I did some research to help me narrow it down (Again Consumer Reports was a God-send). I chose a mattress (the Simmons Kids ComforPedic) with a foam core (instead of coils) because they’re much lighter, which will make frequent sheet changing easier. It also has a waterproof cover for easy cleaning. It’s firm on one side for infants (firm mattresses reduce SIDS risk) and plusher on the other side for toddlers (makes sense to have a two-in-one mattress since our crib converts to a toddler bed). I chose this mattress over less expensive ones because it is Greenguard and CertiPUR-US certified, meaning it is less likely to contain toxic chemical or emit noxious fumes. It’s also got a 35-year warranty; I’ve rarely made use of a warranty, even if something breaks, but it shows that the manufacturers stand by their product. This entry was posted in Mindful Pregnancy and tagged baby, consumerism, crib, decor, furniture, nursery, pregnancy by Barbie. Bookmark the permalink.